U.S. officials confirm that Russian military aircraft conducted airstrikes today in the vicinity of the city of Homs, Syria -- with the Russians giving the United States only an hour's advance notification that the airstrikes were about to occur through a message conveyed to the U.S. Embassy in Baghdad, Iraq, U.S. officials said. The officials had no details on what kind of Russian aircraft conducted the airstrike in the vicinity of Homs, or what the Russians were targeting. The officials also said it appeared Russia had also conducted airstrikes north of the town of Hama, which lies to the north of Homs. The Russian Defense Ministry did not initially confirm Russian airstrikes but then said the Russian Air Force had begun airstrikes in Syria directed at ISIS territory and targets. Hours after the airstrikes, Secretary of Defense Ash Carter compared the move to "pouring gasoline on the fire" because it's contradictory to say that fighting ISIS and supporting Syrian President Bashar Assad can work together." "It does appear that they were in areas where there probably ... were not ISIL forces and that is precisely one of the problems with this whole approach," said Carter. At the United Nations earlier this afternoon, Secretary of State John Kerry said the United States would welcome Russia's military efforts and "multiply the pressure" on ISIS, but only if Russia keeps to its word to hit only terror targets. "But we must not and will not be confused in our fight against ISIL with support for Assad," he said. "Moreover, we have also made clear that we would have grave concerns should Russia strike areas where ISIL and al Qaeda affiliated targets are not operating. 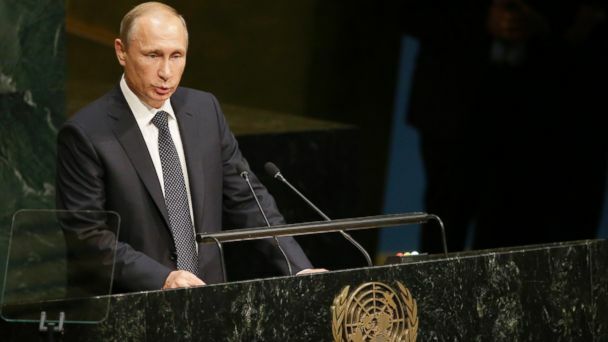 Strikes of the kind would question Russia's real intentions fighting ISIL or protecting the Assad regime." Earlier today, Russia's upper house of Parliament unanimously approved Russian military operations in Syria. At a meeting with government officials in Moscow, Russian President Vladimir Putin said Russian military support to the Syrian military would be limited to air operations and not involve Russian ground forces. Putin said Russian military participation in Syria was based on a Syrian request and on the basis of international law, according to Russia's Interfax News Agency. But the U.S. official noted that there is no major ISIS presence in Homs, which is located in western Syria. Over the past three weeks, Russia has moved 32 fighter and bomber aircraft to the airport in Latakia, a city on the Mediterranean. That airport has been developed by Russia into a military operations hub, according to U.S. officials. "There doesn't seem to be any operational effect on ISIL where they are flying," said the official, who used the acronym used by the U.S. government to describe ISIS. A Russian general attached to the newly created intelligence center set up by the Russians, Syrians, Iranians and Iraqis in Baghdad went to the U.S. embassy and notified the defense attach that Russia was going to begin flying airstrikes in Syria in an hour, according to the U.S. official. The official characterized the notification as an advisory that Russian aircraft would be flying over Syrian airspace. There was no specific mention of where the airstrikes would occur or any demand that U.S. military aircraft totally leave Syrian airspace. The Pentagon confirmed Tuesday that Defense Secretary Ash Carter had ordered staff to begin work "to open lines of communication" with Russia to "de-conflict" air operations between both countries over Syria. With the potential of U.S. and Russian military aircraft flying over the same airspace in Syria, U.S. officials have stressed the need to "de-conflict" their air operations to avoid military encounters between the two military forces. That could involve the sharing of planning for current or future air operations to reduce the chances of an air collision or hostile fire on friendly forces.